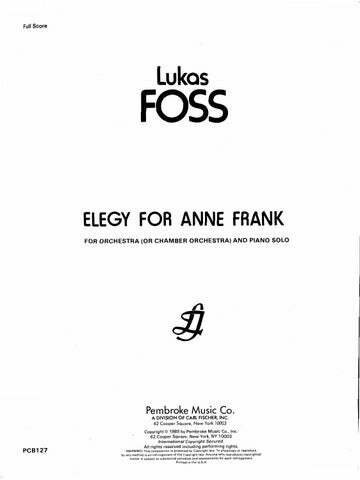 In 1937, as a fifteen-year old prodigy, Lukas Foss came to America to study at Philadelphia’s Curtis Institute of Music. By that time, he had already been composing for eight years, starting under the guidance of his first piano teacher, Julius Herford, in Berlin, the city of his birth. He also studied in Paris with Lazare Levy, Noel Gallon, Felix Wolfes and Louis Moyse, after his family fled Nazi Germany in 1933. At Curtis, his teachers included Fritz Reiner (conducting) and Isabelle Vengerova (piano). By age 18, the young musician had graduated with honors from Curtis, and was headed for advanced study in conducting with Serge Koussevitsky at the Berkshire Music Center, Tanglewood and in composition with Paul Hindemith at Tanglewood and Yale University. 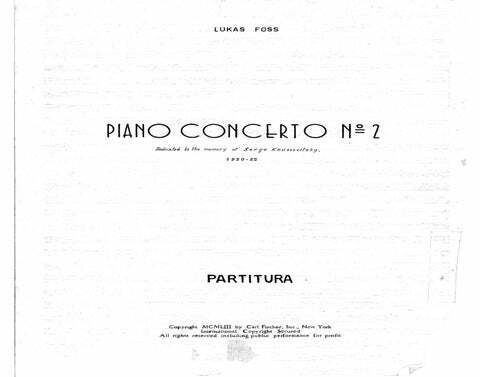 From 1944 to 1950, Foss was the pianist in the Boston Symphony Orchestra and in 1945 he was the youngest composer ever to receive a Guggenheim fellowship. Lukas Foss’ compositions of the last fifty years prove that a love for the music of the past can be reconciled with all sorts of innovations. 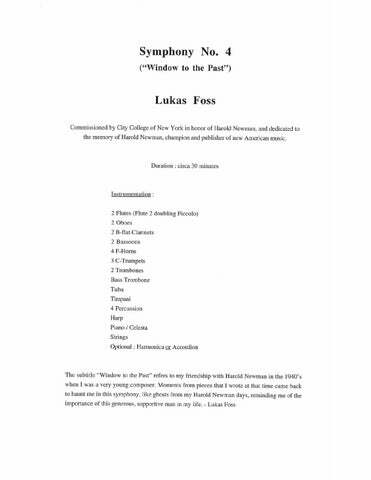 Whether the musical language is serial, aleatoric, neoclassical or minimalist, the “real” Lukas Foss is always present. The essential feature of his music is the tension, so typical of the 20th Century, between tradition and new modes of musical expression. Many of his works – Time Cycle (1960) for soprano and orchestra, Baroque Variations (1960) for orchestra, 13 Ways of Looking at a Blackbird (1978) for soprano and small ensemble, Tashi (1986), for piano, clarinet and string quartet, and Renaissance Concerto (1985), for flute and orchestra – are landmarks of the 20th Century repertoire. 10:00 Solo flute, violin (2); vln. (3); perc. (3), pno. (2), hp. for Orchestra 4:00 2 2 2 2 – 4 3 3 1; Timp. Perc. Pno.(opt. Org.) Hp. Str. 25:00 3 2 3 1 – 3 3 2 2; 4Perc. Elec.Pno. Cel. Elec.Org. Hpschd. Elec.Gtr. Str. 8:00 3 2 3 1, A.Sax.(opt.) – 3 3 0 0; Perc. Elec.Pno. Elec.Org. Elec.Gtr. Str. 7:00 2 2(opt. Recorder) 0 0 – 2 2 0 0; 3Perc. Cel. Hpschd. Str. 10:00 3 2 3 1, A.Sax. – 3 3 1 1; 4Perc. Elec.Pno. Elec.Org. Elec.Gtr. Str. 13:00 3(Picc.) 3(E.H.) 3(B.Cl.) 3(Cbsn.) – 4 3 3 1; Timp. 2Perc. Pno./Cel. Str. 7:00 2(Picc.) 2 2 2 – 4 3 3 1; 3Perc. Pno.(Cel.) Hp. Str. 18:00 2 2 2 2 – 4 2 3 1; Timp. 3Perc. Pno. Hp. Elec.Gtr. Str..
3:00 2(Picc.) 2 2(B.Cl.) 2 – 2 2 2 1; Timp. Perc. Pno. Str. 25:00 3(Picc.) 2 3(B.Cl.) 2 – 2 2 1 1; Timp. Perc. Pno. Str. 10:00 3(Picc.) 3(E.H.) 3(B.Cl.) 3(Cbsn.) – 4 3 3 1; Timp. Perc. Pno. Hp. Str. (fully realized/non-aleatoric version) 10:00 3(Picc.) 2 2(Cl.2 dbl. Eb Cl.[opt.]) 1 – 2 2 1(or t.) 0; 3Perc. Elec.Pno., Elec.Org., Elec.Gtr., Str. 15:00 2 3(E.H.) 3(B.Cl.) 2 – 3 3 3 1; Timp. Perc. Elec.Org. Str. 19:00 Solo baritone voice; 3(Picc.) 2 3(B.Cl.) 3(Cbsn.) – 4 3 3 1; Timp. 3Perc. Pno. Cel. Hp. Str. for Voice and Orchestra 31:00 Solo soprano voice; 3(Picc.) 3(E.H.) 3(B.Cl.) 3(Cbsn.) – 4 3 2 0; Timp. Perc. Hp. Str. 12:00 3(Picc.) 3(E.H.) 3(B.CL.) 3(Cbsn.) – 4 3 3 1; Timp. 2Perc. Pno.(dbl. Cel.) Hp. Str. 28:00 3(Picc.) 3(E.H.) 3(B.Cl.) 3(Cbsn.) – 4 3 3 1; Timp. 3Perc. Pno. (or Cel. ; 1 or 2 players) Org. Hp. Str. 30:00 2(dbl. Picc.) 2 2 2 – 4 3 3 1; Timp. 4Perc. Pno. Hp. Harmonica or Accordian (opt.) Str. 31:00 3(Picc.) 3(E.H.) 3(B.Cl.) 3(Cbsn.) – 4 3 3 1; Timp. Perc. Pno. Hp. Mandolin Str. 28:00 SATB chorus; 2 3(E.H.) 3(B.Cl.) 2 – 3 3 3 1; Timp. Perc. Org. Str. for Guitar and Chamber Orchestra 26:00 Solo guitar; 1 1 1 1 – 1 1 1 0; 2Perc. Pno. Hp. Str. 14:00 Solo Vcl. ; 1 0 2(dbl. B.Cl.) 1 – 1 2 2 0; Perc. Pno. Str. 16:00 Brass quintet; 1 1 1 1 – 2 0 0 0; Timp. 2Perc. Str. 28:00 Solo Vcl; 0 0 0 0 – 2 1 1 0; Perc. Pno. Org. Str. 3:00 Solo violin, or flute; 1 0 1 1 – 1 1 0 0; Timp. Perc. Pno. Str. 34:00 Solo Pno. ; 3 2 3 3. Ten.Sax. – 4 3 1 1; Timp. Perc. Pno. Str. (Prelude, Fugue, and Chorale) 15:00 Solo brass quintet; 1 1 1 1 – 1 1 1 0; Perc. Pno. Elec.Gtr. Str. 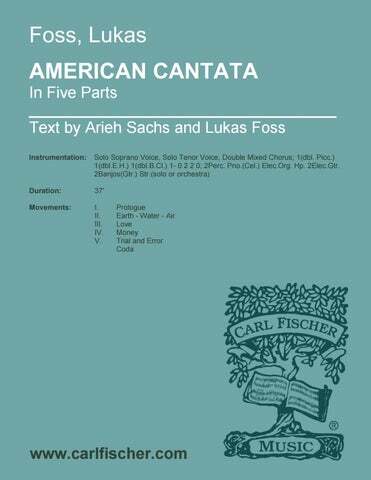 32:00 Solo tenor voice; narrator; SATB chorus; 3(Picc.) 2 2 2 – 2 2 1 0; Timp. Perc. Pno. Str. 24:00 Solo Pno. ; 2 2 2 2 – 2 2 2 0; Timp. 2Perc. Hp. Str. for Flute and Orchestra 20:00 Solo flute; 1 1 1 1 – 1 2 1 0; Timp. Perc. Hpschd.(opt.) Hp. Str. 10:00 SATB chorus; 2 2 2 2 – 2 2 1 0; 2Perc. Str. 16:00 Solo Pno. ; 1 0 1 1 – 1 1 1 0; Str. 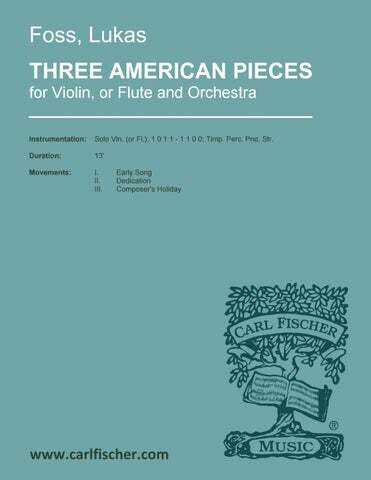 for Solo Violin, or Flute and Orchestra 13:00 Solo violin, or flute; 1 0 1 1 – 1 1 0 0; Timp. Perc. Pno. Str. 22:00 Solo soprano voice; 2 0 2 0 – 2 2 1 0; Timp. Perc. Hp. Str. 16:00 Solo Pno. ; 2 1 2 1 – 1 2 0 0; Perc. (1 or 2 players) Str. Opera in three acts 2:00:00 Solo soprano (13), mezzo-soprano (4), alto, tenor, baritone (2), bass (2) voices; SATB chorus; 2 2 2 2 – 2 2 1 1; Timp. Perc. Pno. Cel. Str. Opera in one act 9:00 Solo baritone voice; SATB chorus; fl., cl., bsn. ; hn. ; pno., hp. (optional); str. Opera in one act 45:00 Solo mezzo-soprano, tenor (2), baritone (2), bass (2) voices; SATBB Chorus; 1 1 2 1 – 1 2 1 1; Perc. Pno. Str. 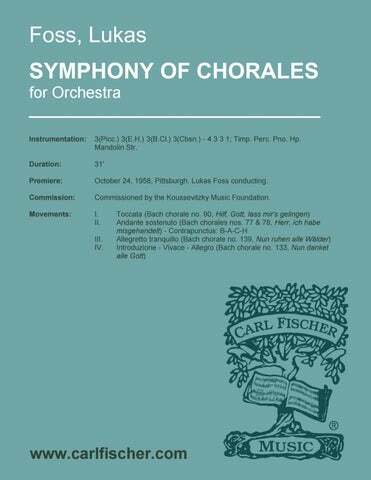 (Chamber Version) 32:00 Solo tenor voice; narrator; SATB chorus; Perc. Pno. Org. Str. 13:00 SATB chorus; 0 0 0 0 – 2 1 1 0; Timp. 2Pno. Org. Hp. Str. SATB chorus; 2 0 2 1 – 2 1 1 0; Timp. 2Pno. Hp. Str. for Chamber Ensemble 13:00 Solo mezzo-soprano voice (opt. ); narrator (opt. ); pno. ; vln. (1 or 2), vla., vcl. 12:00 fl. (2), a. fl., ob. (2), eng.hn., cl. (2) (opt. Eb cl. ), b.cl., bsn. (2), cbsn., a.sax., t.sax., b. sax (opt. sub. w/ 3 hn. ); hn. (2), tpt. (3), tbn. (3), tba. 4′ picc., fl. (2), ob. (2), eng.hn., cl. (2), b.cl., bsn. (2), cbsn., hn. (4), tpt. (3), tbn. (3), tba. ; timp., perc. (arr.) 10:00 picc., fl. (2), ob. (2), Eb cl., cl. (2), bsn. (2), cbsn. ; hn. (4), tpt. (4), tbn., b. tbn., tba. ; perc. Using melodies and forms from Renaissance composers, Foss has constructed a true virtuoso work, morphing these older forms and tunes into much more modern styles, using just about every playing skill in the flutist’s vocabulary.